Sen. Kamala Harris, a former prosecutor, says she was "born realizing the flaws in the criminal justice system." The California Democrat is not only seeking to become the first woman to be president, but the first black woman. Inspired by Supreme Court Justice Thurgood Marshall, the first African-American to sit on the nation's highest court, she pursued a career in law to help right the wrongs she saw. That ambition would eventually take her from the San Francisco district attorney's office to the California attorney general's office to the Senate. Now she hopes it will take her to the White House. She's seeking to not only become the first woman to be president, but the first black woman. Addressing inequality is a top priority for her. That includes her LIFT the Middle Class Act, a tax cut plan that would give families making less than $100,000 annually a credit of up to $500 a month, saying that "when we lift up the economic status of families, neighborhoods thrive, society thrives. All of us benefit." She is also taking on the controversial idea of reparations, which would provide a form of compensation to those harmed by past discrimination, such as slavery and Jim Crow. 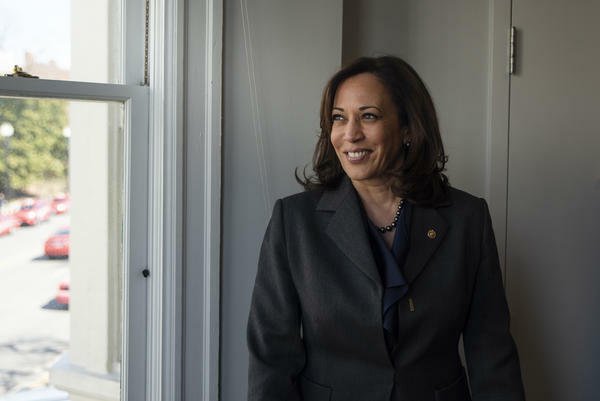 Harris is the second 2020 presidential candidate NPR's Morning Edition has interviewed for its Opening Arguments conversations exploring presidential hopefuls' central messages. The first was Sen. Cory Booker of New Jersey. Inskeep interviewed Harris about her time as California attorney general, her views on immigration, criminal justice issues and more. "I disagree with any policy that would turn America's back on people who are fleeing harm. I frankly believe that it is contrary to everything that we have symbolically and actually said we stand for. And so I would not enforce a law that would reject people and turn them away without giving them a fair and due process to determine if we should give them asylum and refuge." Harris draws directly on her personal experiences in California in explaining her approach to immigration. Her focus contrasts with the criminality often emphasized by President Trump. She told NPR, for example, about children she met on a bus in Marietta, Calif. — unaccompanied minors who had been sent by their parents away from high-crime areas in Central America, who were being "exposed to unknown perils, [but] their parents decided that was better than them staying where they were. So that tells you how bad it was where they were." Her use of the phrase "would not enforce a law" is prime for Republican criticism. Yet immigrant rights advocates have argued the administration's policies violate international human rights law, including a program that forces asylum-seekers to wait in Mexico for their assigned court dates in the U.S.
"The term 'reparations,' it means different things to different people. But what I mean by it is that we need to study the effects of generations of discrimination and institutional racism and determine what have been ... the consequences and what can be done in terms of intervention to correct course." The issue of reparations is one that Democratic candidates have embraced so far this cycle, generally pitching policies that aim to address economic inequality. In this interview, though, Harris emphasizes a disparity in health outcomes that she attributes to "environmental" rather than genetic factors. "It is centuries of slavery — violence associated with slavery," Harris said. "There was never any real intervention to break up what had been generations of people experiencing the highest forms of trauma, and trauma undiagnosed and untreated leads to physiological outcomes." Inskeep: Is there a federal equivalent [to California's moratorium on the death penalty] that you would do? Federal executions, of course, are quite rare. Inskeep: A moratorium, an end. Harris: Yes I do, I do believe that. Harris: No one would be executed if you were president of the United States, for any crime. Harris here takes a page from Democratic California Gov. Gavin Newsom, who recently announced a moratorium on the death penalty in his state, saying it was a "personal" and "moral" issue for him. Harris takes Newsom's decision a step further by applying it to the whole country, telling Inskeep that if she were president, no one would be executed in the U.S. for any crime — not even treason. She adds, though, "I absolutely and strongly believe there should be serious and swift consequence when one human being kills another human being. ... I am unequivocal in that belief. So let's be very clear about that. There should be justice." The former California attorney general often touts her prosecutorial background as an asset, which could appeal to independents, but she's already faced backlash from some within the Democratic Party about her record. An analysis from Vox found that while she did support programs helping people find jobs instead of sending them to prison, she "also fought to keep people in prison even after they were proved innocent. She refused to pursue the death penalty against a man who killed a police officer, but also defended California's death penalty system in court. She implemented training programs to address police officers' racial biases, but also resisted calls to get her office to investigate certain police shootings." She tells NPR that it's a "false choice" to suggest that someone is either tough on crime or soft on crime. Instead, she argues, people should be "smart on crime," pointing to public health as a model. "If you want to deal with an epidemic — crime or health — the smartest and most effective and cheapest way to deal with it is prevention first," she says. "If you're dealing with it in the emergency room or the prison system, it is too late and it is too expensive. We have to be smart on crime." "So I decided to take this issue on from a perspective of not wanting to have to prosecute those kids later in their life. So the issue that I took on it was to put a spotlight of your public safety on the issue of the education of these children, to hopefully get you to prioritize their education and to say, 'Let's put all the resources possible into making sure that they are in school.' And I'll tell you frankly the other reason was to put a spotlight on the fact that the school districts and the people who had a responsibility to make sure these kids weren't getting all of the resources they needed, to put a spotlight on the fact that that wasn't happening and it needed to happen. "Nobody went to jail, and hundreds and hundreds and hundreds of families went through our program, which was a program of getting greater resources to them so the child could be in school every day. The goal was for these children to be in school every day. The youngest of our children, who were missing critical days of their education that they could never make up. That was always the goal, and that was the goal that we achieved." This is another part of Harris's record as California attorney general that recently came under scrutiny after a video surfaced of her defending her decision to crack down on truancy. "I believe a child going without an education is tantamount to a crime," she says in the 2010 video. "So I decided I was going to start prosecuting parents for truancy." In her interview with Inskeep, Harris tries to put that decision in context, making the argument that her crackdown actually highlighted the problem of child care for many parents and that they were able to access resources to help them meet their needs. Senator Kamala Harris was at the Capitol yesterday, voting against one of President Trump's judicial nominees. Then she went down the street and walked into a Democratic Party office. She pulled up a chair and gave us the opening argument of her presidential campaign. KAMALA HARRIS: Middle class, working families in America today are losing. The rules have been written in a way that has excluded support of those families. INSKEEP: MORNING EDITION is hearing opening arguments from prominent declared candidates. What would they do if elected? Several want to direct money to people toward the lower end of the income scale, and that includes Harris. She wants families with incomes under $100,000 to receive a tax credit of up to $6,000. Why is it, in your view, a good idea to hand someone a check? - to hand them a tax refund, to hand them a tax rebate, to let them claim some cash. HARRIS: I don't think we can have this conversation without including carried interest (laughter). INSKEEP: She is referring to one of the advantages wealthy people claim in the tax code. Harris is a former San Francisco district attorney. She was also California's attorney general before the Senate. And one of her initiatives as district attorney has drawn criticism for how harsh it sounds today. When you prosecuted parents whose kids missed school, were you doing that out of some larger, social concern? What was on your mind? HARRIS: So I did an analysis when I was DA of who the homicide victims were who were under the age of 25 when they were killed and learned, at the time, that 94 percent of them were high school dropouts. Today 70 percent of the people in prison are high school dropouts. So I decided to take this issue on from a perspective of not wanting to have to prosecute those kids later in their life. And it was because we got more services for these kids. And we put a spotlight on the fact that transportation was a big issue for some parents - just getting their child to school. We learned that, you know, if a parent is working two jobs and they've got a 7-year-old and then the 2-year-old gets sick, they might say to the 7-year-old, stay home, and take care of the 2-year-old, because having child care, you know, and paying for that extra day is going to be too difficult. It was things like that. INSKEEP: But was there something, in retrospect, kind of undignified about going to that parent with the two jobs and the two kids and one of them is sick and prosecuting that parent? That was your opening bid to them. INSKEEP: Or you'll be prosecuted. HARRIS: ...So that - so there were - nobody went to jail. And hundreds and hundreds and hundreds of families went through our program. INSKEEP: There's a federal death penalty. HARRIS: I think that there should be. INSKEEP: There's nothing that rises to that level. INSKEEP: As state attorney general, Harris defended the death penalty because she says it was the law. But she declined to seek the death penalty, even for a man who killed a cop. That is just one of the issues she would influence as president. Having spent your career devoted to the rule of law, how would you apply the rule of law to the problem of people who are in the United States illegally? INSKEEP: In the absence of that, though - last two, three presidents haven't been able to do that. HARRIS: Well - but, no, because you're asking me if I were president, which I fully intend to be (laughter). I'm going to tell you that we have to pass comprehensive immigration reform. And I'm actually happy to share with you that I think that there's bipartisan consensus. INSKEEP: But in the absence of that, which is the situation that the last president was in and the president before him was in, what are you going to do with those 11 million people? HARRIS: Well, I'm, one, not going to vilify them for the sake of scapegoating a whole population of people. I'm going to keep America's promise to, for example, those DREAMers who receive protection under DACA - Deferred Action for Childhood Arrivals. I believe that we have to keep our promises. INSKEEP: I'm thinking of a time when President Obama was dealing with unaccompanied minors coming to the U.S.-Mexico border. And the president was reported to have said, I'm the chief executive. There's a law. We have to enforce the law. We have to send them back. Would you anticipate doing that - enforcing laws that, you may yourself feel are immoral or wrong, but it's simply the law? HARRIS: So let me just - to the point of that moment in our history - tell you how I handled it. I was attorney general at the time. And I will never forget being at home watching the evening news. And in Murrieta, Calif., there was a group of these children on a bus. When a group of our countrymen surrounded that bus, shouting at these young people, go back to where you came from - and then I heard about what was happening in Washington, D.C., which is there was a discussion about how we need to expedite these hearings to send them back to where they came from. INSKEEP: That was the goal - judicial proceedings more quickly, yeah. HARRIS: Yeah. Now, let me tell you. Again, people in Washington were saying, expedite these cases. Get them done in two weeks, for children who - I will never forget the images - who were sitting on a chair. Their feet were dangling. That's how small they were. And we were going to expedite these cases to have them tell a perfect stranger, in a language or a dialect they don't speak, about the trauma that they were experiencing in their home country, which required them to seek refuge in ours. And so I got on the phone with managing partners from law firms up and down the state of California and said, let's get pro bono legal services to help these children who otherwise were not entitled to attorneys. All of that to say, one - I disagree with any policy that would turn America's back on people who are fleeing harm. I, frankly, believe that it is contrary to everything that we have symbolically and actually said we stand for. And so I would not enforce a law that would reject people and turn them away without giving them a fair and due process to determine if we should give them asylum and refuge. INSKEEP: ...To believe there are more. HARRIS: Climate change, Yemen, Syria, Venezuela - go down the list. You're right. INSKEEP: Suppose there are far more people seeking refuge in the United States than even there are now. You'll let them in. HARRIS: I will not deny them a process of determining whether we should and can let them in. I would not deny them that process. INSKEEP: An opening argument from Democratic presidential candidate Kamala Harris. Transcript provided by NPR, Copyright NPR.